And suddenly it was time for our next tri. I have to admit, I hadn’t been training as much as I should have been. Well, the big difference for this tri was that the swim was in a bay. Also, it was slightly less than an olympic distance tri. Race morning, we show up and I get everything ready in my transition and head down to the water to warm up. The water was pretty chilly, not nearly as cold as the first tri we did earlier this year, but cold enough that I decided to wear the wetsuit. Warming up with the wetsuit on, I was amazed at the extra buoyancy! I heard that it really helps, but I felt like a moon man with no weight in the water! Jack did really well again too! Finishing 12th overall and 2nd in his age group! Later that evening, after laying out my the pool all afternoon, we looked up a decent beer bar and headed out! 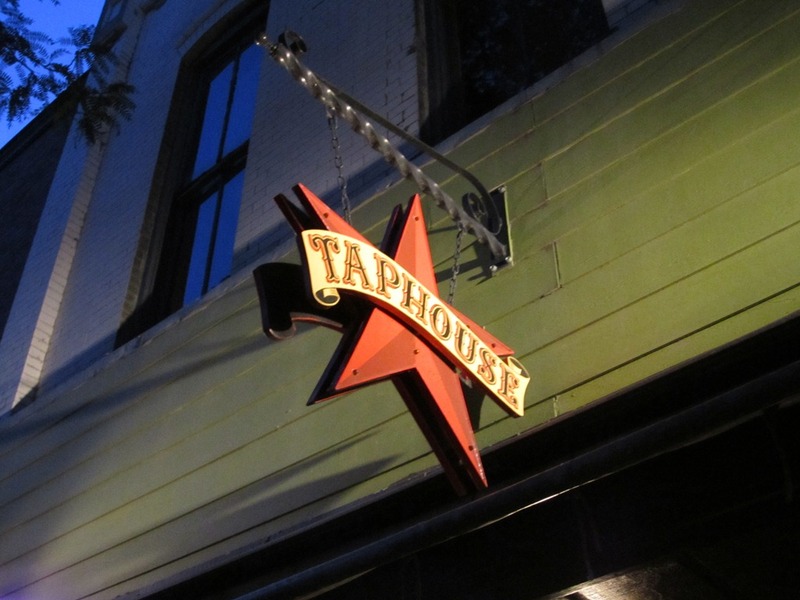 We found the Taphouse Grill in Hampton, VA. They had a nice selection on draft and So I couldn’t resist the St Bernardus Abt 12 by Brouwerij St Bernardus of Watou, Belgium at 10% abv. Its one of the best quads I’ve had! Sweet dark fruits, cherries, plums, and lots of malts. A little sweet and bready, biscuits. Candied sugars, warming sensation, smooth. Very well done. 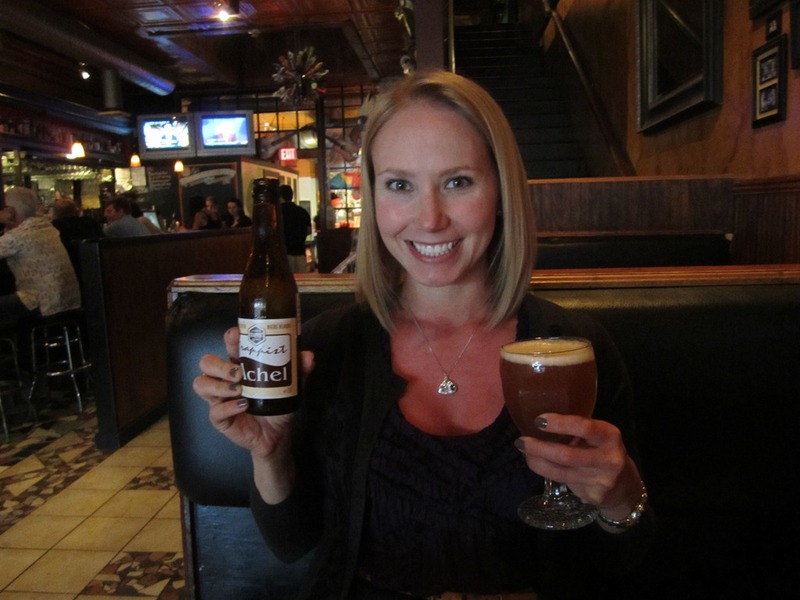 Next up, I ordered the Trappist Achel 8 Bruin by Brouwerij der St. Benedictusabdij de Achelse of Hamont-Achel Belgium at 8% abv. Rich and creamy. Bready and Belgian yeastiness. Dark fruits, raisins. Moderate carbonation. A fairly sweet beer, but well balanced with the dry finish. After we had our fill we headed back out onto the street. They had closed the street off and were having a little block party with local cover bands! Friday night, Jack and I took Kristen out on a dinner date in DC since her boyfriend was out of town. We didn’t make reservations to get into our first choice but luckily another Belgian Restaurant was across the street, Sur La Place, and we got in there after a little wait. 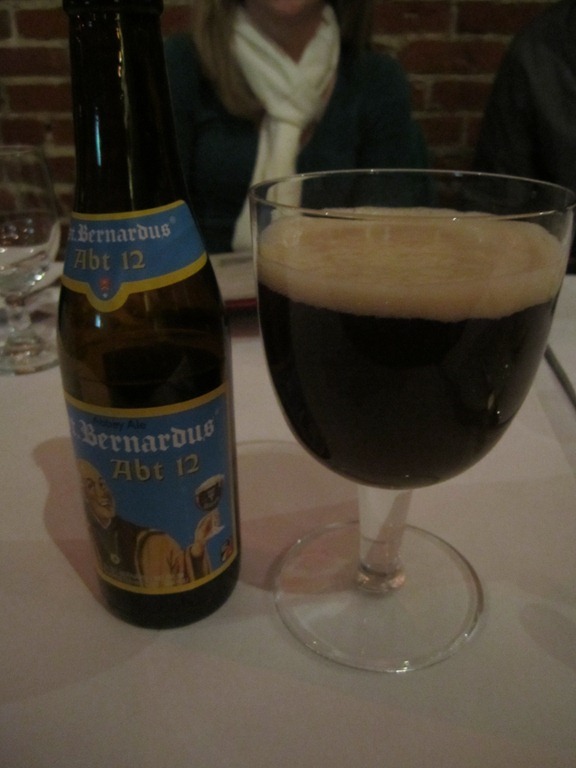 I ordered a St Bernardus Abt 12 by Brouwerij St Bernardus, Belgium Considered a quadrupel at 10%abv. Pours a very dark brown, mmm, yeasty and bready, but sweet like plums and vanilla, figs and cloves. Smooth,boozy and medium carbonation. I was starving and drank this while munching on the delicious warm bread and butter. So good! 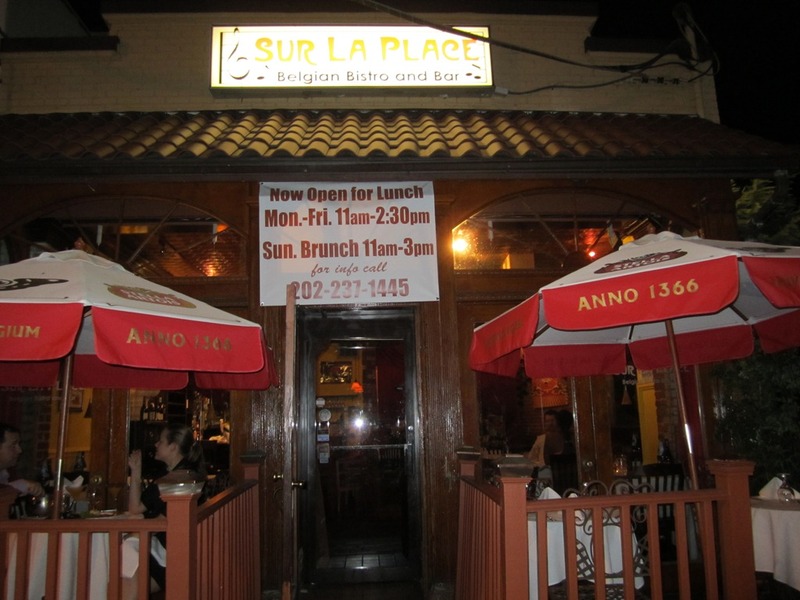 I really like Sur La Place because everything seems to run a little slower there. Yeah, it may take a while to order the food and get the food, but you don’t feel like you are being rushed. Its nice! You can enjoy sitting down to dinner for a while and getting a chance to enjoy the conversation and the company. I ordered the asparagus wrapped in smoked salmon and a blood sausage with lentils. I love blood sausage! And now I’m starting to feel like an adult because I like asparagus! 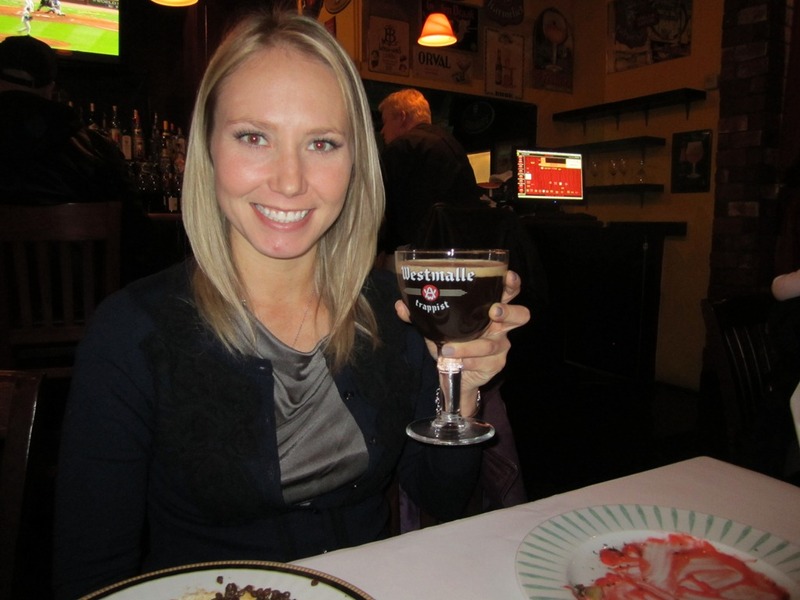 Next I ordered the Westmalle Trappist Dubbel by Brouwerij Westmalle in Belgium 7% abv. Pours dark brown with a reddish tint, very smooth, velvety and sweet like dark fruits and caramelized sugar. 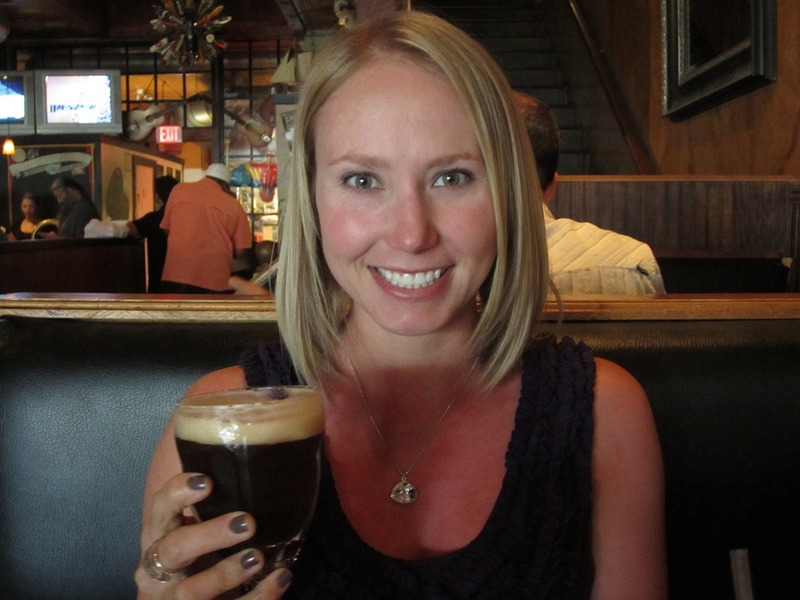 This beer was basically my dessert, so good! Just sip and enjoy! What a wonderful date night! 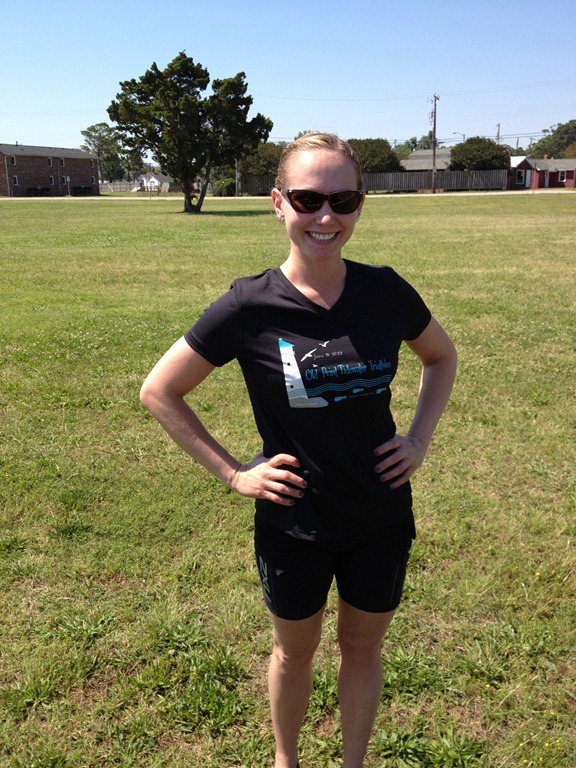 Thanks for joining us Kristen!